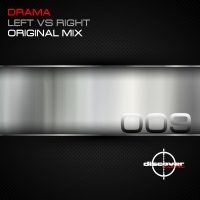 Drama's love of all things techno has always permeated his musical creations. We have watched this prolific and talented producer slowly morph from trance through to tech trance and ultimately into the pure techno sound that is typified by Left vs. Right. A strong groove and bass laden bottom end lock you in from the start as Drama shows that he knows how to create one in more than name only. We love a good Drama track - and he never disappoints!!! 'Left vs. Right' is available now from Beatport and iTunes.